After OSCE nations pledged in 1990 to hold free and fair elections, election observation – one of the most transparent and methodical ways to encourage commitment to democratic standards – became a core element of the OSCE’s efforts to promote human rights, democracy, and the rule of law. 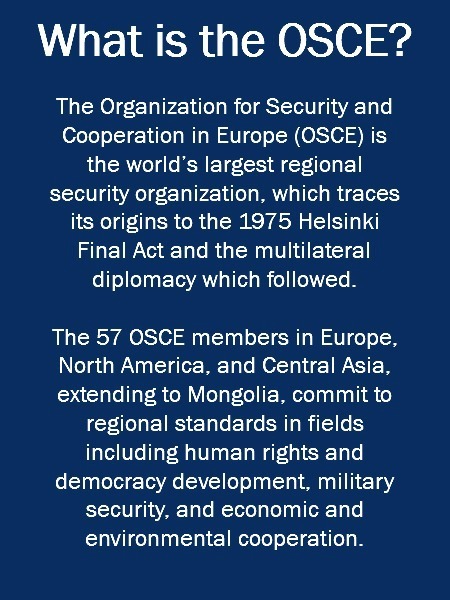 In 1990, all OSCE countries voluntarily committed to holding democratic elections that meet the same basic standards: universal access, equality, fairness, freedom, transparency, accountability, and privacy in voter submission. Because violations of these commitments can endanger stability in the OSCE region, as well as within an individual country, OSCE nations also agreed to open their elections to observers from other participating countries. To encourage compliance and confidence in the results of the observation missions, countries agreed to observe elections together under the OSCE umbrella. Since the 1990s, OSCE election observers have been present at more than 300 elections throughout the OSCE region. While some OSCE countries benefit from foreign observation more than others – especially those that formerly had one-party communist systems and little experience with democracy – the OSCE also observes elections in more established and stable democracies, such as the United States, Canada, Germany, and the United Kingdom. As one of the original 35 members of the OSCE, the United States has participated actively in OSCE election observation missions, both by providing observers for foreign elections as well as by inviting the OSCE to observe every general and midterm election since 2002. By analyzing election-related laws and systems, as well as the effectiveness of their implementation, election observation missions help ensure that elections in OSCE countries are free and fair for voters and candidates alike. OSCE election observation missions often are undertaken jointly by the OSCE Office of Democratic Institutions and Human Rights (ODIHR) and the OSCE Parliamentary Assembly (PA). The missions, which combine strong technical expertise and sound political judgement, include ODIHR officials, professional analysts, parliamentarians, and others on loan from OSCE member countries. To ensure that no single country’s point of view is overrepresented, the OSCE limits the number of observers from any one country. No matter where they are from, observers must commit themselves to an election observation code of conduct, which limits their role to observing and reporting. Observers have no authority to instruct, assist, or interfere in the voting, counting, tabulation, or other aspects of the electoral process. Ahead of the elections, observers receive briefings from the host government, political parties, civil society, and media representatives. Long-term observers also follow pre-election activities including candidate and voter registration, political campaigns, and media coverage. On Election Day, two-person teams of short-term observers fan out across the country to observe the conduct of the election, including opening of polling stations; checking whether ballot boxes are empty and properly sealed; the counting of ballots; the handling of spoiled or unused ballots; and the transmission of polling station results. Observers monitor how voters are processed, the accuracy of voter registries, and whether voters are able to vote in secret and in an environment that is free from intimidation. After the elections, long-term observers note how electoral complaints and appeals are handled. The OSCE election observation mission publishes preliminary findings immediately after the elections, with a final comprehensive report issued a few weeks later. The final report includes in-depth analysis of the election’s political context and legislative framework; election administration; voter and candidate registration; the election campaign; the media; participation of women and national minorities; and the voting, counting, and tabulation processes. The OSCE methodology represents the global standard for quality election observation. Its expertise has been shared with other regional organizations, and the OSCE has contributed to observation efforts outside the OSCE region. The U.S. Helsinki Commission was the first to propose concrete commitments regarding free and fair elections more than a year before they were adopted by the OSCE in June 1990. By that time, Commissioners and staff had already observed the conduct of the first multi-party elections in seven East and Central European countries transitioning from one-party communist states to functioning democracies. As the OSCE developed its institutional capacities in the mid-1990s, the Commission joined the efforts of an increasing number of observer teams from across the OSCE region, which evolved into the well-planned, professional election observation missions of today. Commissioners and staff have observed well over 100 elections since 1990. The Commission continues to support OSCE observation efforts, focusing on countries where resistance to democratic change remains the strongest. * Following Needs Assessment Missions designed to assess the situation and determine the scale of a potential observation activity in a particular country, election observation was deemed unnecessary in some cases.